Thomas: Hello and welcome to another edition of Shrunken Head Reviews. Today we will be looking at the last film in the Harry Potter Canon. Well guys, after a lengthy run, it's come to a conclusion. Any thoughts? Smith: No. Don't look at me! Thomas: You knew it had to end sometime. Smith: Nothing has to end, ever. The magic can't die. Thomas: Pull yourself together man. We've got to do a review here. Smith: *snif* You're right. I'm ready. Thomas: So what did you think of Death Hallows Part 2? Smith: It was good. Sad, but good. The action was fantastic. Thomas: Better than the first half you felt, right? Smith: Yeah. Well, with part 1 I felt it was the worst entry into the series. But then I was also against the idea of making it into two films in the first place. Smith: Of all the books I thought it was the one that had the most that could be cut. I just think if you were going to split one of of the movies into two, the last one wasn't the one to go with. Thomas: Jeffrey, what did you think of the movie? Jeffrey: Oh, now you want to talk to me? At the theater you seemed only to happy to get as far away from me as possible. Thomas: You kept walking up to small children and telling them you were Dobby's head come back to life. Jeffrey: What? They liked it. Thomas: Oh, that's what their terrified screams meant. Thomas: Do you have any thoughts on the movie? Jeffrey: I'm what you'd call a casual fan of Harry Potter. I've never read any of the books, but I've liked the movies enough to keep watching. I thought it was a nice ending to the series. A little disappointed when Harry died. Smith: What?! Harry didn't die! 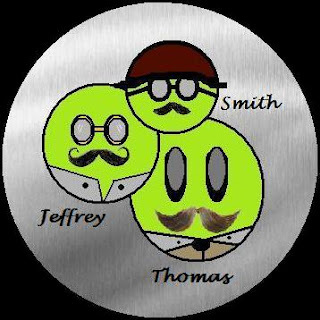 Jeffrey: Why Smith, you wouldn't be handing out spoilers to our audience would you? Jeffrey: Way to stand by your convictions. Thomas: Could we? Are you sad to say goodbye to such beloved characters? Jeffrey: Is it goodbye? Come on... With as lucrative as the series has been, I give it five years before they start remaking the whole lot. Smith: No way. These actors are way too engraved in the minds of people to remake it that quickly. They'd have to wait for the youngest part of this current generation to grow up and start feeling nostalgia. We're talking at least 20 years before they start talking remake. Jeffrey: Course Rowling could always write another book and they'd have a chance to trot out all the sets again. Smith: I'd be up for that. Jeffrey: Really? No! I'm surprised. Smith: Sarcasm? What a surprise. Jeffrey: Shouldn't be. I'm sarcastic all the time. Smith: I was being ironic. Jeffrey: Oh, you mean like a 'no smoking' sign on your cigarette break? Smith: That's not ironic. Actually nothing in that song was ironic. Thomas: Guys, we're getting way off topic. I think everything that could possibly be said about that song was said like a decade and a half ago. Time to move on. Listen to some new music. Besides, I've always felt the song was cleverly ironic by having nothing to do with irony. What'd you guys think of the special effects? Smith: The series has always carried excellent effects with it, with the exception of the horrid centaur in the first movie. This one was no different and made the magic come across very realistically. Smith: Seriously? How could you not like the effects? Jeffrey: No, I mean with Thomas. Actually, there's that one line in the song where the guy on the plane that's crashing says "well isn't this nice." That is in fact quite an ironic statement. Smith: Huh. Sorry Thomas, but he's right. Thomas: Hate you both. I better wrap this up before they start singing. For my own part I thought the film was an excellent close to the series. And while it's sad to think that there won't be another Potter film, it's a very complete series that I think will hold up to time. Through the books and movies, these characters really have become like friends. Deathly Hallows is a good way to bid them goodbye until a day, years later, when we are ready to pull them out from their cupboard, possibly under the stairs, and revisit them. Any final thoughts guys? So long as it's not that damn song. Cause I really don't want to hear anymore about it. Thomas: Really? Who would have thought? Loved reading this although my co-workers are probably now wondering about my mental state with all the giggling. I haven't seen this one yet - but I'm going to. It's good to know it's a nice way to say goodbye to much-loved characters. This was an excellent post!!!! Crap, you're right - there probably will be a reboot in a few years. Harry lives forever....well as long as E books exist...nice to know they got the last one right...r u a reviewer for Rotten Tomatoes by any chance,,,that good a post!!! For shame Jeffery. For shame. I just hope Smith is going to be OK. I really need to watch those movies or read those books, huh? Thanks for entering my caption contest...heehee....one of the commenters after you really liked your caption! And to think that even after this engaging reparte I still have no interest in anything Harry Potter...which one of the heads does that make me??? I just heard that song on the radio yesterday and I was thinking that nothing in that song is ironic. Great review as usual. I'm probably one of the very few people on earth that has not read any of the books, or seen the movies. My granddaughter is reading the books now and told me I need to watch the movies.